​One of the best kept secrets in the United States is the hidden wealth and value embedded in every community, even the ones considered to be “poor.” We treat struggling neighborhoods, and the people who live there, as one of our societies’ social ills that need to be fixed. Residents of these neighborhoods internalize the negative assessment and work hard to overcome not only economic poverty, but the poverty of shame, other-ness, social isolation and stigma. Is it no wonder that increasingly, these places tend not to trust our interventions. Based on years of daily engagement with amazing people who live in a wide range of poor communities, we believe that distressed communities need a different kind of partner: one who focuses on creating the spaces and opportunities to reveal, generate and exchange the hidden value and capacity that already exists in people and place, and to connect those people and places to mainstream economic life. We call these interventions the new community marketplace or “The Q Way” . We believe that the range of “value” that can be optimized in place is broader than that found in the marketplaces of mainstream capitalism. In a human-scale marketplace there is the opportunity to create deep exchange in real time that goes beyond even local goods and services – to things like advice and support, services and favors, a kind word when we need it, to an extra hand, the benefit of doubt when we make a mistake. These things are the currency of effective community life. Our Invitation: Trusted Space Partners is always on the look out for people and places interested in experimenting with “The Q Way”. We have many ideas for how it can be linked to parents, students, neighbors, co-workers etc. Please let us know if you are interested in co-experimentation. ​The Q Campaign is an effort by the Mt. Washington Alliance working in the Mt. Washington neighborhood of Haverhill MA to bring awareness and action to improving the quality of life in that area. This effort is part of a larger initiative in Haverhill funded by the Working Cities Challenge, sponsored by the Federal reserve Bank of Boston. 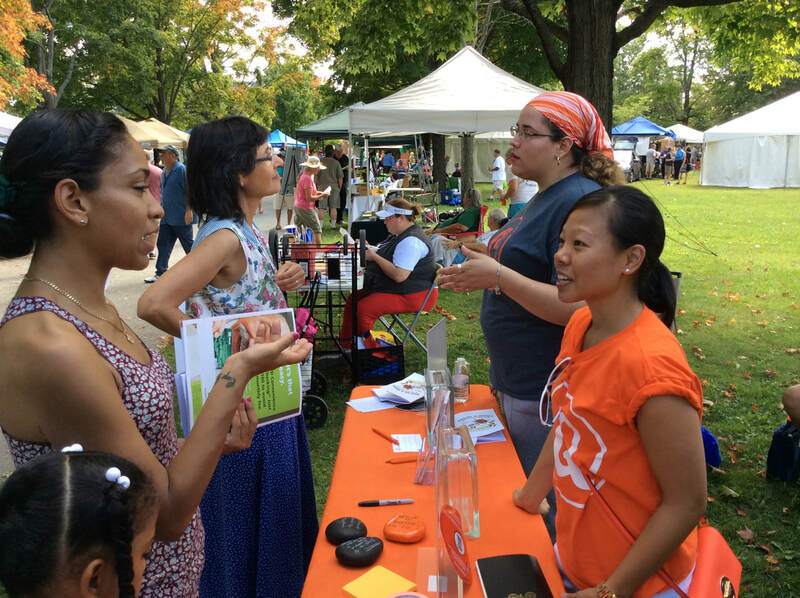 The Q campaign is rooted in the Network Organizing approach to building ever expanding networks of residents and stakeholders who share an aspiration for quality of life and who see strengthening relationships as a key to positive local change. What is your Quality of Life like here in the Mt. Washington neighborhood? What’s good about it and what could be better? What quality gifts do you have that you’d love to contribute to community life here in the neighborhood? What’s the one thing that you could help make happen that could really improve the Quality of life for you and others here? Network Nights – In the first 3 month phase of the campaign the group held weekly Network Nights where residents could come together, have good food, have productive small team conversations and exchange favors. In the second phase – Q 2.0, Network nights are happening every other week. Q Contest – In Phase one of the campaign the group sponsored a ‘pitch contest’ to solicity ideas for improving the quality of life and offered implementation prizes of $1,500 to each of 3 winning ideas. Q 2.0 will include a 2nd pitch contest around a priority emerging from the Network Night conversations. ​ In 2013 to 2014, we teamed up with a diverse group of residents to open up a new physical and figurative space for regular people to come together to share good life. Our motto was “wisdom was everywhere”. ​These sample schedules, and the pictures above , illustrate the wide range of exchanges that took place during this 18 month experiment. We co-produced a video with our friends at ______ to help spread the message and wrote a paper on our lessons learned, which can be accessed here. We’re interested in helping others replicate this approach or to improve upon what we tried and learned. We joined an incredible, collective community garden soon after moving to NC, and while gardening, we mentioned the benefits of Network Night as a way to build closer relationships and share in the jobs of running the garden. The Garden of Concord now hosts a Neighbor Night four times a year! These are some of our favorite moments of community where we live! We have been privileged to help start a new Saxapahaw Social Justice Exchange, sparked and led by LaShauna Austria and Claire Haslam. 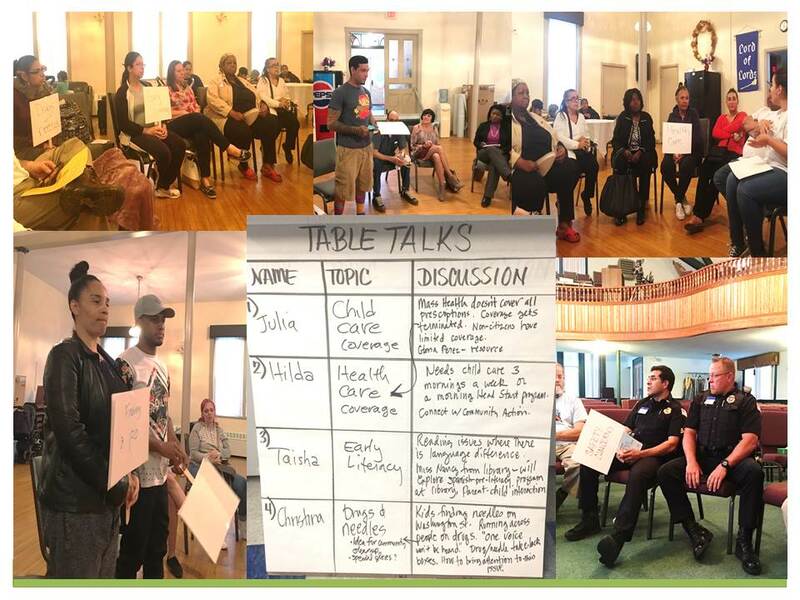 The exchange meets once a month, and regularly uses the devices of table talk and marketplace (key components of the Network Night) as a productive way to keep the learning and shared action going during these critical times of struggle and change. To our surprise, we have become involved in a local faith community, led by a very open and creative pastor (Rev. Sue Eldon). This past year, she and other leaders decided to experiment with a Sunday brunch once a month, in lieu of a formal church ceremony. We eat incredibly delicious farm to table meals, discuss the application of scripture to daily life, share communion....and then end with one of TSP's marketplaces. We strengthened some key relationships due to the matches made on a Sunday morning!